The planning for our rafting trip down the Grand Canyon started over 12 months ago, with a BBC TV programme re-creating the exploits of John Wesley Powell. 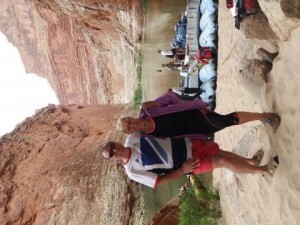 The white water and sheer excitement hooked us and our flights from the UK were booked as soon as they were available. As the trip got closer nearer the excitement and anticipation grew as the days counted down. Needless to say we were not disappointed. The early morning encounter in Las Vegas with fellow travellers suggested we were going to get along famously. The flight into Marble Canyon was a thrill and on landing were met by our guides and directed to the store to buy essential supplies of beer and wine! Kitted out, briefed and then we were off and also immediately into our first small rapid, which at the time seemed so big! Soap Creek was the biggest rapid, which got us used to what to expect later on in the trip. No going back now! Idyllic first nights camp under the stars, American sized steaks and excited banter, what more could you ask?? Our guides, Ronnie and Jeff were expert boatmen and were so informative about the history of John Wesley Powell, the geology and Grand Canyon National Park. The highlight of the second day was a pit-stop at Redwall Cavern, where we Brits attempted to demonstrate the arts of Rugby with an American football and our body surf down the blue waters of the Little Colorado River . The weather on Day 3 took a turn for the worse for our big rapid day, however the spirits of the travellers and crew remained high as we tackled and overcame the big one's: Unkar, Hance, Sockdolger Grapevine, Horn Creek, Granite and Hermit, followed by the Gemstone rapids to much whopping and hollering. Plenty of 'eating rubber!'. By now the smaller rapids were being easily taken in our stride, with no concerns!! Visits to the stunning Elves Chasm and Blacktail canyon along with Ronnie negotiating Dubendorf were day 4 best bits. Our final full day on the river as we tackle Upset rapid, before parking the rig in the middle of a rapid to visit clear blue waters of Havasu Creek, before sweeping majestically through the fearsome Lava Falls rapids. Final evening was the Captains dinner with a veritable feast of food and tall tales of heroics from the past 5 days. The final trip was the incredible helicopter flight out of the Grand Canyon to Bar 10 Ranch. All in all an amazing and awesome trip with Western River Expeditions, whose attention to detail and quality of the guides made our long trip from the UK so worthwhile. We also met some fabulous new friends from across the pond who no doubt helped make it such a memorable experience, which come highly recommended. We will be back sometime! !